Wow! I had a great weekend. Olivera and I went to Galichnik for the 50th annual Galichnik Wedding Celebration. Months back, when I first heard of this event, I knew I had to see it. A few weeks ago, I signed us (Olivera and me) up for a tour to Galichnik. Dan was working his last weekend so was unable to go. The tour company didn't get enough tourists, so the tour was canceled. I had a feeling that would happen so Olivera and I had already been working on Plan B. Olivera father's family came from Galichnik. 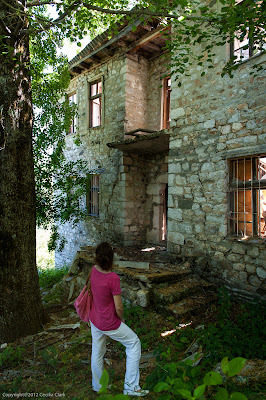 She contacted someone she knew who lived near Galichnik who then went to the only hotel in Galichnik and called her. Olivera talked to the hotel and made a reservation for us. We would have a room with a shared bath down the hall. 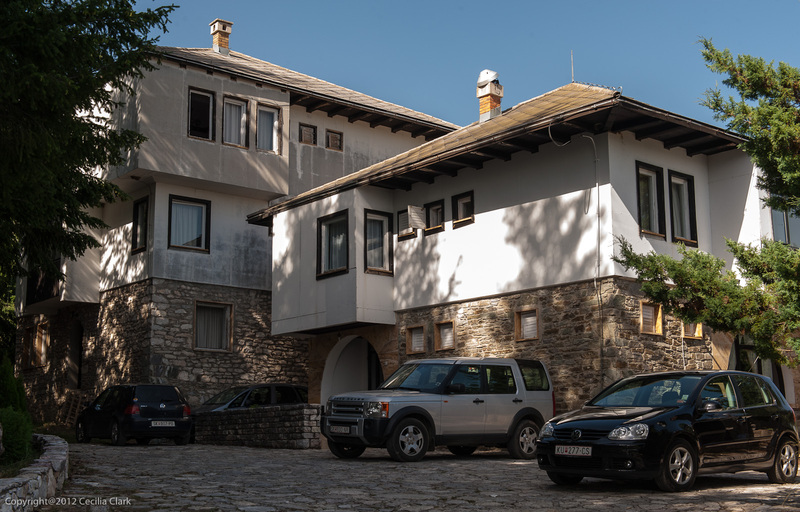 The hotel told Olivera that the best rooms (with bath inside the room) were already reserved for the President of the Republic of Macedonia. We figured that if the President was staying there, the hotel couldn't be all that bad. I reserved a rental car and we were set. Friday evening I picked up Olivera and we traveled the 120 km (74.5 miles) southwest to the mountain village of Galichnik. 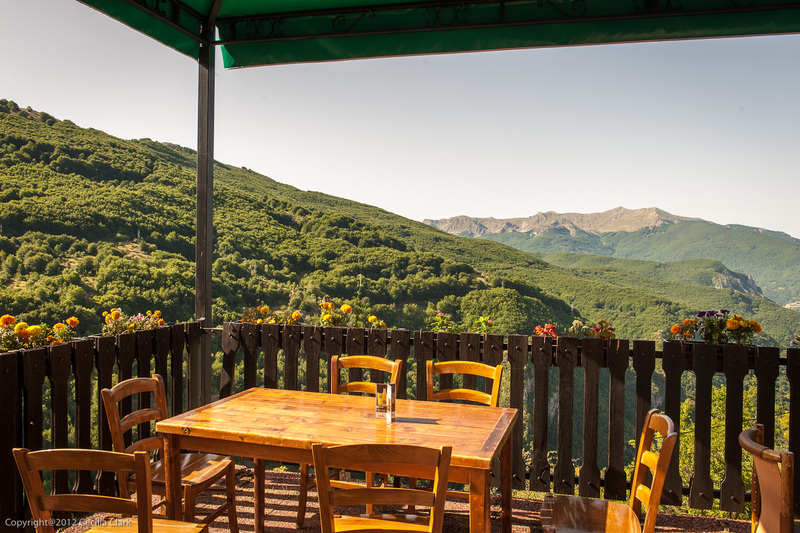 Galichnik is perched on the slopes of Bistra Mountain at an elevation of 1,400 meters (4,593 feet) so the air is fresh and very clean. 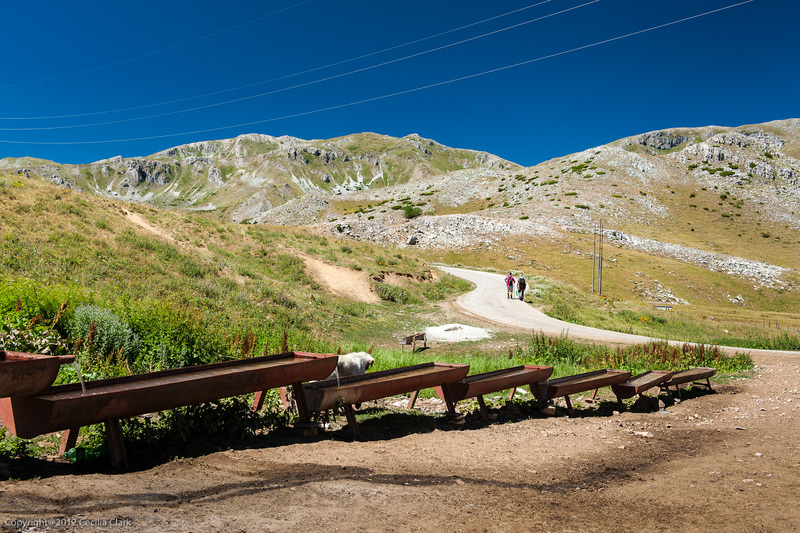 There is one road to Galichnik and it ends at the Hotel Neda--where we had our reservation. Hotel Neda was a surprise. Despite being told by a travel agent friend that there was only one hotel in Galichnik and the bathrooms were outside, Hotel Neda (hotel_neda@yahoo.com or tel: +389 (0)77 26 88) was lovely. Our room had bare wood floors a double bed, a closet, and good lighting. The room was on one of the upper floors and located at the back corner of the hotel with a view of pines trees. The bathroom was just down the hall but Elena, the proprietor, assured us that no one else would be using our bathroom. Saturday morning while having breakfast, a hotel guest named Aleksander asked me if I'd like to join him and his friends. Aleksander was with his cousin Metodija, both are Macedonians with a Galichnik family heritage, and a couple from Holland. Aleksander and his wife were married in the 1996 Galichnik Wedding Celebration. He is also a member of the Galichnik council. After breakfast, I joined Aleksander and friends on a hike to the rock where Galichnik women bid farewell to the men. As the departing men went down the mountain, women would call out to their men hoping their voices would create a psychological impression to make the men return to them. 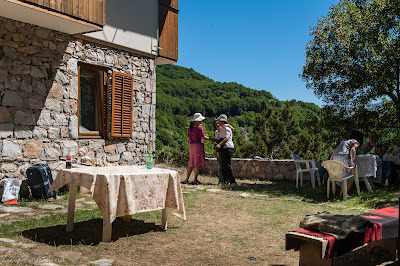 After the hike, Metodija took me and the Dutch couple to visit the sheepfold. We looked at the flock and chatted with some of the shepherds. Pre-WWII there were 500,000 sheep grazing the area. Presently, there are about 8,000. 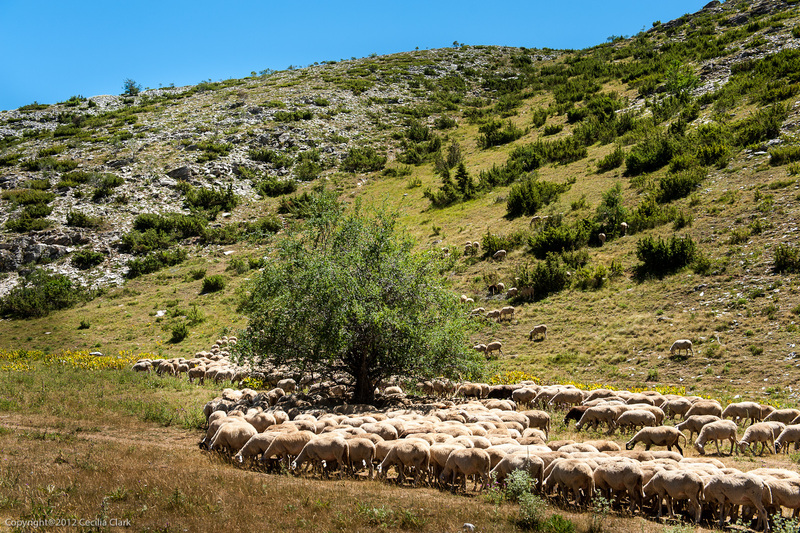 The sheep are trucked to Negotino for the winter. Shepherds are paid about 350€ each month plus meals. They are away from their families for months at a time. 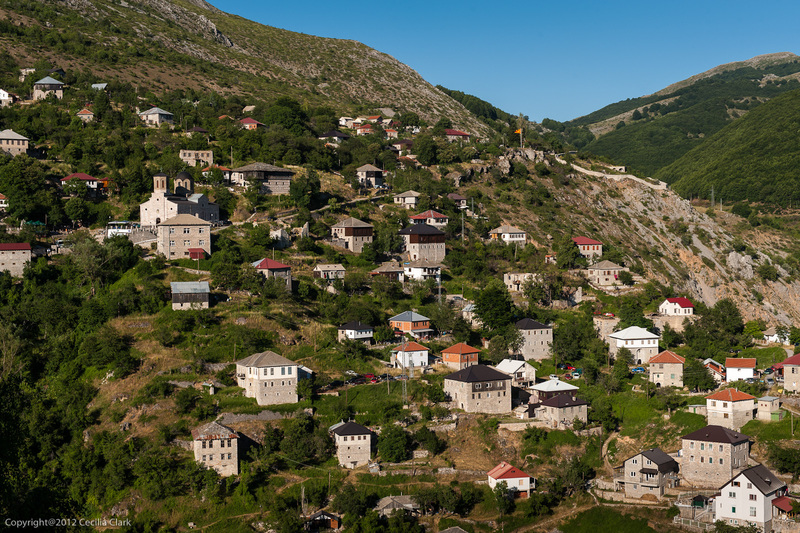 Written accounts of Galichnik date back to 1493, but some people say the village of Galichnik may be 1,000 years old. Why did people settle in such a inhospitable location? One story I read suggested people came to protect their daughters from Ottoman soldiers. They also may have settled here to preserve their Christianity as the lower, more accessible villages did convert to Islam. In previous centuries, the main industry was raising sheep and all products connected with sheep. But if you weren't a shepherd or cheese maker, there weren't many other ways to earn a living in Galichnik. Most men became economic migrants traveling to work in cities around the world. Their occupations included stone masons, painters, woodworkers, carpenters. When a son reached the age of 15 he would join his father to travel abroad and learn the family craft. While men were gone for 1 to 5 years at go to earn their living, women and girls stayed behind in Galichnik. Even the shepherds were not in Galichnik during the winter months as they drove the flocks to lower elevations in Negotino. In order not to miss their friends and relatives returning to Galichnik, it was agreed that when the men returned, they should come around St. Peter's Day (July 12). While men and boys were away, marriages were arranged. When the single men returned, mass weddings were held on St. Peter's Day. The average age for a girl to marry was 13-16 years old (I've also been told 15-20 years old). Imagine being 15 years old and marrying a boy or man that you haven't seen for years who will then leave you after 2-3 weeks to return to his job abroad. The young bride, now pregnant, might not see her new husband for a year or longer. Aleksander took us to the Galichnik Museum for our lesson on Galichnik and its weddings. 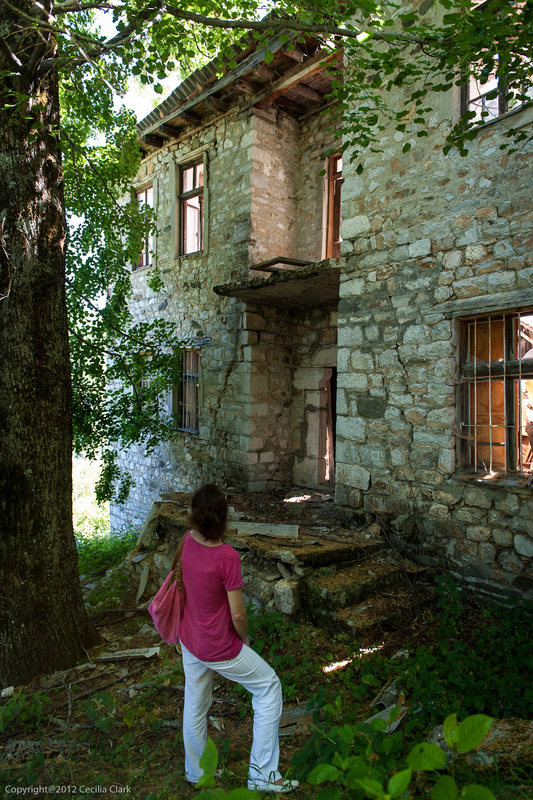 Galichnik is an abandoned village that is occupied by returning families only during the summer months. Most of the residents gave up living year round in Galichnik in the 1960s. Real Galichnik weddings formerly lasted for 10 days. Now, the tourist event is a two-day celebration with a real bride, groom, and wedding, but it is also theater to preserve the 30 or more customs surrounding the ritual. 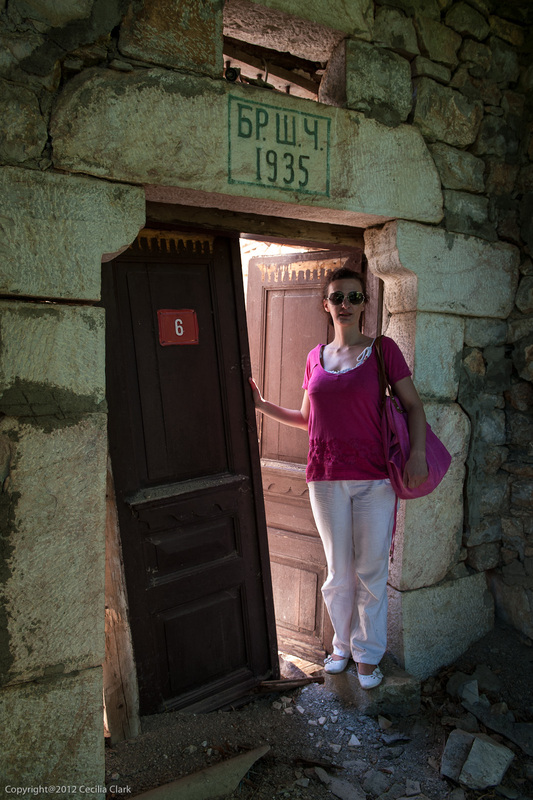 In the afternoon, Olivera and I took a walk to visit her Galichnik heritage. 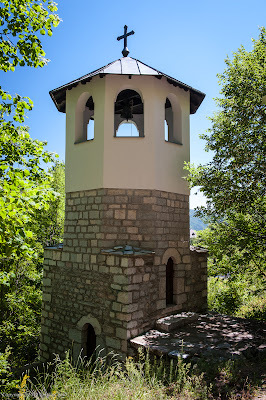 She showed me the bell tower near the Church of St. Petka that was built by her father and his brothers. 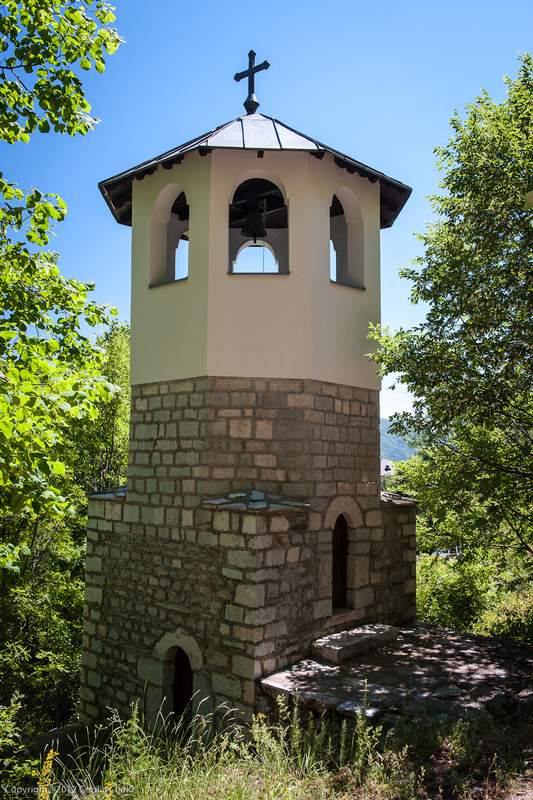 The bell is centuries old and was found and returned from a museum in Bulgaria. Next, we located the house of her grandparents. The roof fell in several decades ago leaving only the walls as patient sentinels. Her grandfather's initials are above the door. In our search for Olivera's family house, we inadvertently found ourselves at the bride's house. The bride's family was very gracious and invited us in. Since we were there, I took a photo of the illusive bride greeting some of her friends. She is in pink with the white hat. Several couples applied for the honor of being the stars of the Galichnik Wedding Celebration, but only one couple was selected. To be considered the couple must never have been married before, be less than 35 years old, and at least one of the candidates must have roots in Galichnik. The bride, 27 years old, is named Danica Torteska; the bridegroom, 29, is Trajche Lozanovski. The bride's family comes from Galichnik. This is the 50th Anniversary of the Galichnik Wedding Celebration. The festivities begin at 7:00 pm. tonight.